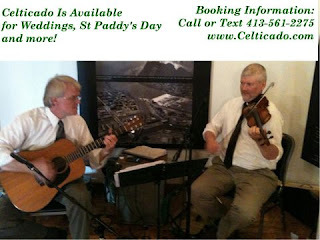 If you want traditional Irish music for your wedding or special event, then Celticado is the go to band. Based in western MA, they are regular performers around town. Celticado is an all acoustic Celtic duo based in the Connecticut River Valley of western Massachusetts and Northern Connecticut. With fiddler Adam Sweet and guitarist James Bunting, the duo specializes in performing delightful Celtic music for weddings, parties and more.